The Yes2You Rewards program is made with a special offer where you can get special rewards for shopping. You can enroll for the program today by getting your email address out to Kohl’s. With this, you can get a special card or app that links to your address and can be used regardless of what you pay for an order at Kohl’s with. You will get a $5 reward for every 100 points that you earn. Kohl’s gift cards are available in store and online. They can also be used at any particular Kohl’s location one wants to go to or at the Kohl’s website. For every dollar spent at Kohl’s, you can redeem points. 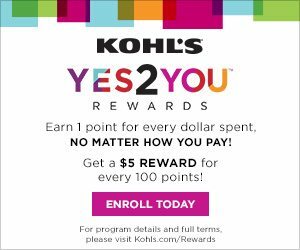 Usually upon earning $50 in points, you will be eligible for a $10 certificate, known as “Kohl’s Cash”. Be sure to use your cash however within two weeks because they do come with expiration dates. 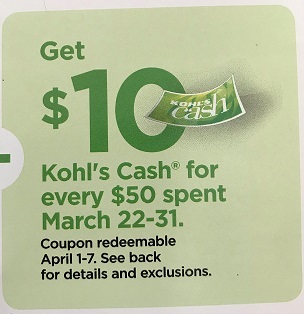 There is no limit as to how many Kohls Cash certificates you can earn. Kohl’s most popular savings promotion is when they hold their 30% off Credit Events for their charge card holders. If you are not a card holder, then you will only be able to receive a maximum of 20% off purchases. Also, many benefits are given to those who spend a certain amount of money on a Kohl’s Charge card. Upon spending $600 in any one calendar year, you will receive “Most Valued Customer (MVC) status. This allows you to receive additional coupons and promotions throughout the year. Stackable codes can be used on the Kohl’s website. During their credit events, look for special deals for specific departments such as $10 off $50 for Jewelry or $10 off $25 for Shoes. These codes can be used in conjunction (“stacked”) with other promotional codes such as 30% off. You can stack up to four codes upon checkout, so make sure to use them wisely to obtain the most savings possible. The MVC free shipping offer from Kohl’s is always applicable when you order $75 or more before tax from the store’s website. 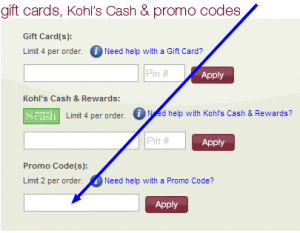 In addition, Kohl’s MVC members can get free shipping on no minimum purchase during their credit events. 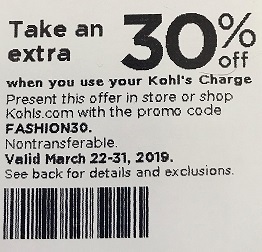 Kohls Update – The 30% off Promotion Code will return on March 22nd, 2019! Kohls sells many items for the home including bedding sets, kitchen appliances, luggage and home décor items. Today’s top promo gets you 15% off purchases, Don’t forget to “stack” other codes for maximum savings! Get an Email when the 30% Code is Back!